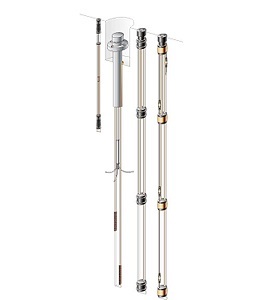 The Model A-3 Multiple Point Rod Extensometer is the preferred design for installation in downward directed boreholes which are easily filled with cement grout. Up to eight anchors can be installed, at various depths, in a 76 mm diameter borehole providing the capability to locate multiple failure plains and zones of movement. Make Enquiry For Product "Jewell Model A-3 Multiple Point Groutable Anchor Extensometer"